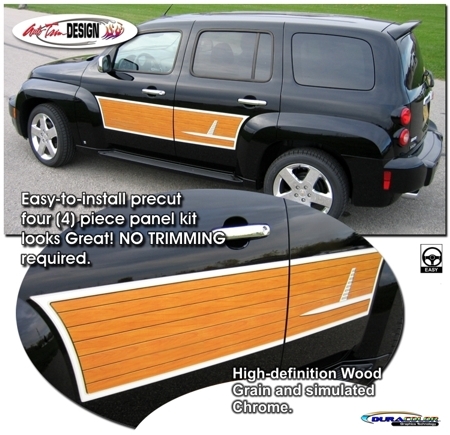 Celebrate the heritage with this unique and easy-to-install Wood Panel & Chrome graphic panel kit. Digitally printed with our DuraCOLOR graphic technology onto premium automotive grade vinyl, the simulated wood grain panels and chrome trim look real! As a further step, graphic is covered with a 2.5 mil clear laminate which provides protection from miles of abuse. Graphic component is covered under an Oracal OCS6 Six (6) Year Limited Outdoor Warranty. Kit is provided with four (4) panels that easily apply between the wheel wells of the HHR as shown (NO TRIMMING required!). Each graphic panel has an overall measurement of 60.198"x 11.72" (152.90cm x 29.77cm). Graphic panel kit is made specifically for the '06-Current Chevrolet HHR and will not fit any other vehicle.